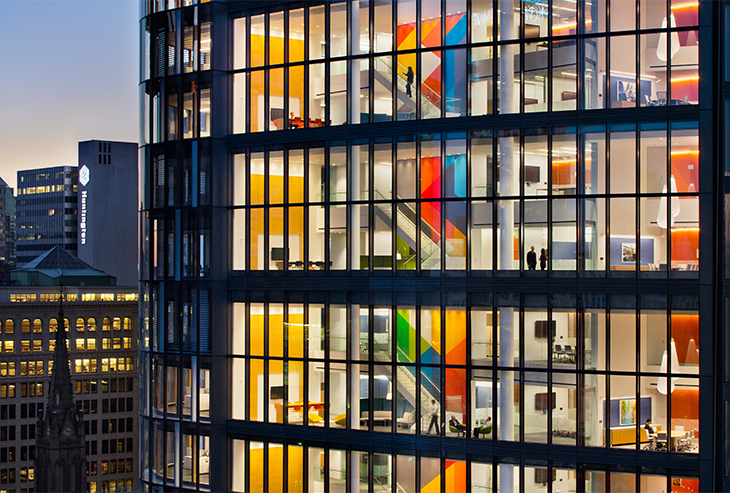 The Tower at PNC Plaza uses a series of innovative glass panels to circulate a constant stream of fresh air, giving workspaces a healthy feel and eliminating environmental staleness. Image © Connie Zhou. Most conversations about wellbeing dwell on exercise routines, dietary regimens, and stress busting tactics from more yoga to less caffeine. Only on the rarest of occasions will wellness advocates mention the role the built environment plays in engendering personal wellbeing. When they do, they tend to focus on how a person’s home can have a positive or negative impact on mental and physical vigor, depending on factors such as natural light saturation and whether or not the décor has achieved peak feng shui. What’s become clear is that far too little of the significant attention now paid to wellness bothers to understand work environments and how they augment or undermine personal wellbeing. This is a curious and potentially harmful oversight considering people spend a significant amount of their daily lives at work and are tangibly affected by the settings they occupy. We cannot achieve anything close to peak wellbeing without providing access to healthy workspaces. Wellbeing at work is the next frontier in the growing effort to promote wellness for individuals and communities, and it is becoming an increasingly important issue facing corporations today. Unhealthy workplaces are not only depressing to behold, they constitute a significant financial strain. Research indicates that healthy employees are three times more productive than unhealthy employees. It’s estimated that employers can lose up to $4,600 of productivity gains per work year as a result of health-related absenteeism, and this number does not account for workers who are present but unable to perform at a high level due to poor working conditions. Wellbeing at work has also become a critical front in the ongoing war for talent that companies around the globe find themselves waging. Personal wellbeing is of particular importance to millennials, who currently make-up 50 percent of the workforce—that number is projected to increase to 75 percent by 2030. Millennials have made it clear that they value personal wellbeing as much, if not more than corner offices and prestigious business cards. They are far more likely to work for an employer that provides an environment conducive to wellbeing, just as they are more likely to stay with an employer that respects their live/work balance. The cost of human capital is significant, and companies with healthy environments do not have to spend heavily on recruiting and retaining the best talent because the talent finds them. While healthy workplaces function as magnets for the brightest and most engaged workers, unhealthy workplaces aggravate occupants with all the ways they fail to address personal wellbeing. How many times have you walked into a workplace and felt trapped in a stale environment that had no tangible connection to the outside world? Unhealthy workplaces place people in drab interiors that are filled to the brim with artificial light and low quality air. They cloister employees in cramped workspaces without a variety of work setting appropriate to the type of tasks they are engaged in. Common areas can be hard to find, and layouts don’t encourage regular circulation or enable potentially serendipitous encounters between colleagues. Vending machines with calorie filled junk food line the break rooms, while meeting spaces demonstrate an acute lack of flexibility, often discouraging fruitful interactions amongst colleagues in the process. In spite of the debilitating ramifications unhealthy workplaces pose, far too many designers and developers fail to understand the importance of wellbeing at work. At least 30 percent of new and remodeled buildings around the world are subject to excessive complaints regarding indoor air quality. Poor indoor air quality has been shown to cause significant health and comfort issues for occupants, and yet little focus is given to this ongoing problem. Designers today pay more attention to environmental sustainability then human wellbeing. Moving forward, we need buildings and workspaces capable of addressing both concerns. When you walk into a workplace, you get an immediate sense of whether or not the surrounding space enhances the physical, mental, and even spiritual wellbeing of the people inside it. Healthy workplaces feature an abundance of natural light, good air quality, and acoustics that absorb distracting noises like ringing telephones and churning printers. 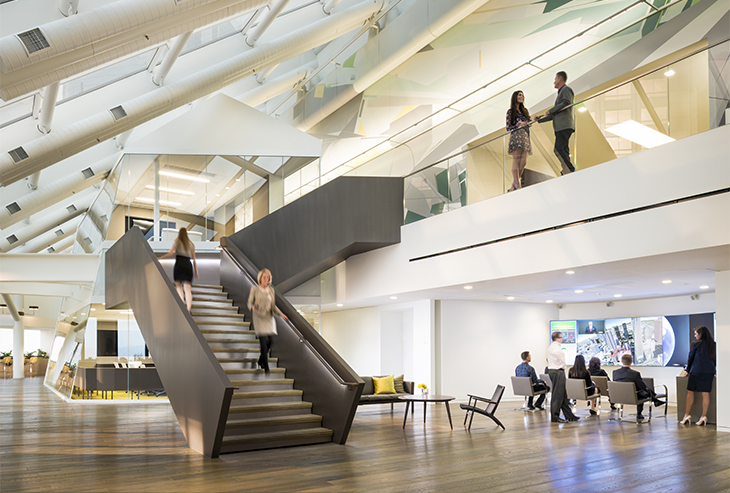 From a design standpoint, healthy workplaces use intuitive design concepts and centralize shared areas like copy rooms, kitchens, and meeting spaces. They incentivize employees to get out of their chairs at regular intervals and stretch their legs. They include signage and wayfinding graphics that inform without distracting. 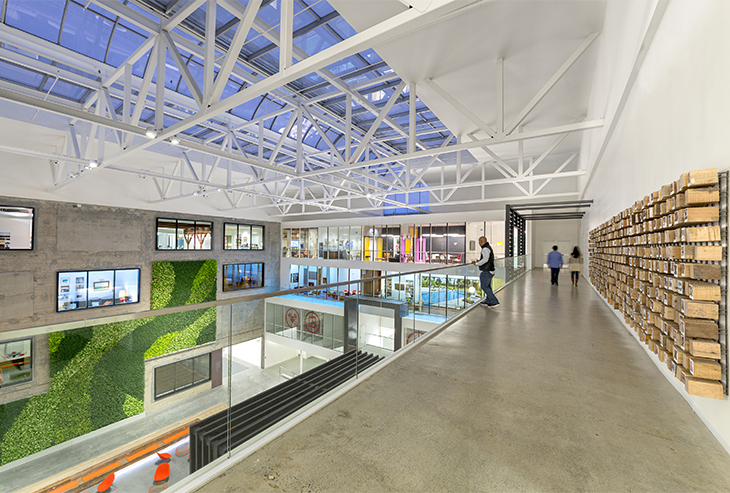 A healthy workplace uses open stairwells to connect workers with one another, and these avenues encourage walking and impromptu interactions. Healthy workplaces exude free flowing relaxed quality that complements the cadences of daily work, while offering workers welcome opportunities to break out of their individual molds and take a moment here and there to recharge and refresh. Healthy workplaces stress the importance of activity and provide something all employees crave: choice. They accommodate walking meetings for those teams who dislike spending long hours plastered in the same seating arrangements. They offer adjustable desks for the growing number of people who prefer taking conference calls standing-up. They foreground healthy snack options. The most progressive workplaces employ people friendly organizational policies, like convenient access to in-building fitness centers and explicit endorsements of the importance of work-life balance. When considered individually, each of these touches may seem trivial, but when taken as a whole they create a physical environment that promotes comprehensive wellbeing for each employee. As the overall focus on wellbeing continues to grow, companies that fail to grasp the role healthy workplaces play in cultivating a high performing work force and an overall culture of success risk losing ground to more forward thinking competitors. It’s that simple. Lewis Horne, the president of CBRE Los Angeles, summed up the importance of wellbeing when he said, “As the substantial return on investment is confirmed, we see that well-being will be a significant part of the marketplace moving forward.” That sentiment is shared by the groups and organizations that support the WELL Building Standard ®; it’s the world’s first building standard focused on human health and wellness, and it’s dictating the directions workplace design takes with much more frequency. Over the past decade, work has become more urban as companies have abandoned isolated suburban campuses for the allure of city centers and mixed-use neighborhoods. It’s also become less formal as the physical walls separating executives from staff have come down and company hierarchies have flattened. It’s become more sustainable as designers find creative ways to use natural resources in an efficient manner and minimize buildings environmental footprints. These trends will continue in the coming years, but they will be joined by a newfound emphasis on employee wellbeing. Providing workers with healthy workplaces that go beyond baseline health requirements and actively promote personal wellbeing is now paramount to ensuring every worker can flourish, be happy, and perform to the best of his or her abilities. The returns of investing in wellness are more than evident. It’s time for companies to embrace this trend. When they do, they will be demonstrating their commitment to their people, resulting in a level of loyalty and appreciation never seen before. Joseph Brancato is a managing principal for the nine offices in Gensler’s Northeast and Latin America regions and holds other leadership positions across the global firm including seats on the Board of Directors and the Executive Committee. Joe is an architect, an urban designer and an ardent believer that architects are inherently problem solvers. Contact him at joseph_brancato@gensler.com.